Ever wonder how and where so many authors get those fantastic “blurbs” on the backs of their books and those glowing reviews on Amazon? For starters, a great many self-published authors and subsidy/vanity publishers buy reviews. This is a troubling trend, not just for its blatant dishonesty but because the reviews then are not a genuine assessment of the work. No person being paid for a review is going to be painfully honest if the book is terrible. All reviews that are paid for are partial and biased at the very least. This is incredibly misleading to the book buying public. Many of the glowing reviews are deceptive, if not outright lies. The reviews may help sell a book, but for those who know about this blatantly horrendous practice, it doesn’t take long to recognize a “canned” review. A book that might otherwise have been purchased may be rejected outright because of the accompanying paid-for reviews. So, how is an unknown author supposed to get those glowing comments? It isn’t easy, and it often takes a lot of time and network building to get the kind of book reviews and blurbs that will help promote a book. Many authors don’t want to take the time to do this. A potentially better, not great way to obtain those first reviews, is to consider doing an exchange with another author seeking help in this area. Be forewarned, however, that the other author’s book may be terrible. How will you deal with this if they give you a glowing, five star review? Be very cautious with this exchange policy, although it is definitely a better approach than paying for a review. Unfortunately, if the author is also new, their name will carry little or no weight. University professors one was fond of or former college companions are another good source for reviews. Remember, the idea is to get a review from someone who is an authority in something. The closer that “something” is to the book’s topic, the better. As one goes about the business of selling books, one will frequently receive feedback back from satisfied customers. By all means, ask these people if they would be willing to share their comments by submitting a review to Amazon or other websites. The more one interfaces with groups on the web, the easier it is to ask someone for a review if a friendship is established. One should not use chat rooms or groups for this purpose only, as it is easy to see through someone who is using the group and not really participating in the group. Don’t do this, as this is just another dishonest maneuver to deceive people. It’s ideal if one can obtain reviews before the book is published. 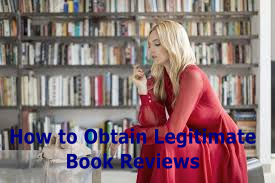 If this doesn’t work, however, collect reviews as they come along and either put them on a website or hand out flyers with the reviews to prospective book buyers. Depending on who the publisher of the book is, it is often possible to re-upload a POD book a second time, the new upload containing reviews. There is a nominal cost to do this, but it may be well worth it.